School math, multimedia, and technology tutorials. Last March 2010, we have discussed several ways on using Google Sketchup to enhance geometric drawings as well as how to use it in classroom teaching. In this article, we will discuss more ideas on how to use Google Sketchup in teaching mathematics. Although Google Sketchup is a drawing software, it can be very helpful to mathematics teachers especially in teaching three dimensional geometry. 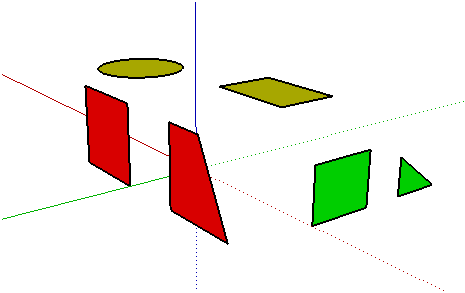 Using Sketchup, it is easy to demonstrate what do we mean by coplanar or non-coplanar as shown in Figure 1.